The Committee on culture of the world organization of United Cities and Local Governments (UCLG) is the global platform of cities, organizations and networks to learn, to cooperate and to launch policies and programmes on the role of culture in sustainable development. We work with various founding documents: the Agenda 21 for Culture, approved in 2004 by cities and local governments from all over the world to enshrine their commitment to human rights, cultural diversity, sustainability, participatory democracy and creating conditions for peace; the political declaration 'Culture: Fourth Pillar of Sustainable Development', adopted in Mexico City in 2010; and Culture 21 Actions, approved in Bilbao in March 2015 on the occasion of the first UCLG Culture Summit. The mission of the Committee on culture of UCLG is “to promote culture as the fourth pillar of sustainable development through the international dissemination and the local implementation of Agenda 21 for culture”. We organise an International Award on Cultural Policies every two years, host a database of good practices on "culture in sustainable cities", convene a global Summit on Culture also every two years, run programmes to support the elaboration and implementation of cultural policies (Leading Cities, Pilot Cities and Culture 21 Lab) and have an advocacy campaign to advocate for culture in the UN Agenda 2030 and the Sustainable Development Goals. We promote the exchange of experiences and improve mutual learning. We analyze global cultural issues and convey the key messages of cities and local governments. 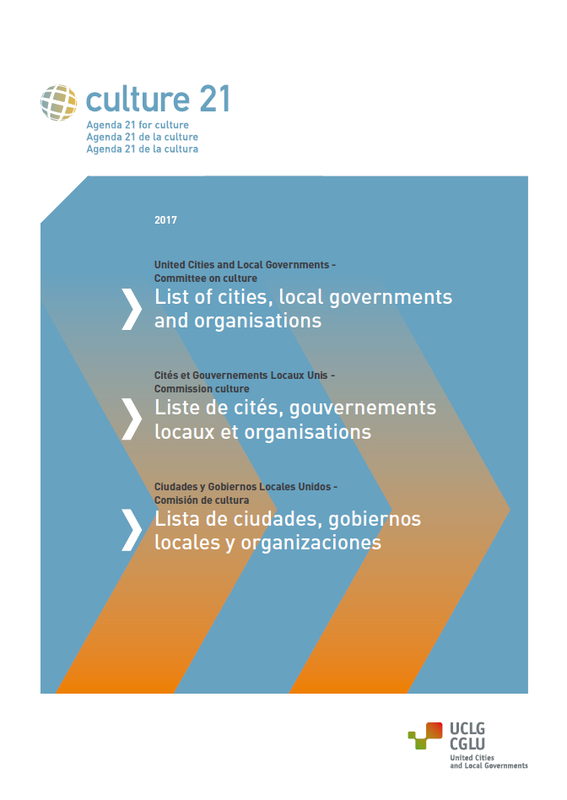 The Committee on culture of UCLG is co-chaired by Buenos Aires, Lisbon and Mexico City and vice-chaired by Barcelona, Bilbao, Bogotá, Jeju, Paris, Porto Alegre and Rome. 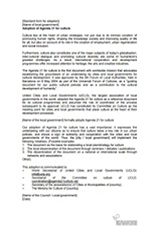 The Committee on culture of UCLG is open to the participation of cities from all continents on an equal basis. A growing number of cities and local governments all over the world have adopted Agenda 21 for culture. The adoption is of great importance both at a local and global level: it expresses a commitment to its residents to ensure that culture takes on a key role in its urban policies, and it also reveals a sign of solidarity and cooperation with the cities and local governments in the world. List of cities, local governments and organisations, on 1st September 2017. Map of the imaginary city of the Agenda 21 for culture. 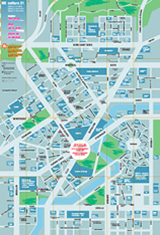 The Map features the cities and local governments, as well as national and international organisations and institutions, which have expressed their support or have promoted the Agenda 21 for culture (according to a list of 1st April 2009). If you wish to adopt Agenda 21 for culture, this document may be an interesting guidance.